Facilities: Administrative U.S. Penitentiary Thomson with an adjacent minimum security satellite prison camp. 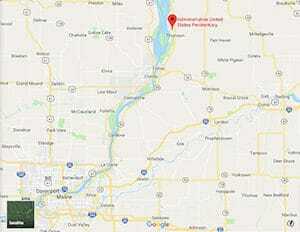 Location: AUSP Thomson is located near the western border of Illinois, 70 miles west of Rockford, Illinois and 52 miles east of Davenport. Background: Originally named Thomson Correctional Center, the facility was built in 2001. The former state prison was purchased by the Federal Bureau of Prisons in 2012. As of 2017, AUSP Thomson is being used to house low security deportable aliens until the facility can be brought fully online. Housing: Inmates are housed in cells. At the camp inmates are housed in dormitories. Health Services: New inmates receive a complete physical examination within 14 days of arrival at the institution. The Health Services Unit at AUSP Thomson functions as an ambulatory outpatient clinic. The medical staff consists of physicians, dentists, mid-level practitioners, and medical and administrative ancillary support staff. Medical and dental sick call, emergency medical treatment, preventive health care services, chronic care, medications, and eye glasses are provided to inmates. Inmates may request a screening for infectious diseases. Inmates must be in the proper uniform and must show their assigned commissary ID card in order to be seen. Psychology Services: New inmates and inmates who have previously identified mental health or drug abuse programming needs are scheduled for an interview with AUSP Thomson Psychology services staff. A psychologist may make recommendations to support the inmate’s successful adjustment to prison and prepare them for their eventual release. Residential mental health programs designed to help inmates with severe emotional, cognitive, and behavioral problems are also available. These programs are for inmates who are having difficulty functioning in a mainline institution due to a psychological disorder. They are designed to improve the day to day functioning of inmates with the goal of helping them return to a mainline institution or preventing the need for hospitalization. Referrals can be made to other institutions with such treatment programs. Residential Drug Abuse Program (RDAP): AUSP Thomson does not house a Residential Drug Abuse Program (RDAP), but a referral can be made to an institution that does offer the program. A drug abuse program, Drug Abuse Education course, and the Non-Residential Drug Abuse Program (NR-DAP) are available. Education Services: AUSP Thomson provides literacy,GED, and English-as-a-Second Language (ESL) programs. Incentive awards are provided to recognize inmates making satisfactory progress and successfully completing the literacy (i.e., GED and ESL) program. Inmates may also receive incentives for progressing to various levels in the GED or ESL programs. Graduation ceremonies recognize GED, ESL, and Occupational Education completions. A parenting program and Adult Continuing Education (ACE) classes are also available. High school diplomas and post-secondary programs are available through paid correspondence programs. Advanced Occupational Education: AUSP Thomson does not offer any advanced occupational education programs. Vocational Training: AUSP Thomson does not offer any vocational training programs. Apprenticeship: AUSP Thomson does not offer any apprenticeship programs. Library Services: Inmates are afforded access to legal materials and an opportunity to prepare legal documents through the use of the TRULINCS Electronic Law Library. Leisure libraries offer inmates a variety of reading materials, including periodicals, newspapers, fiction, nonfiction, and reference books. Typewriters and a copy machine are also available. UNICOR: AUSP Thomson does not house a UNICOR facility. Commissary: Inmates are permitted to shop once per week on a designated day. The commissary spending limit is $360.00 per month. Inmates can purchase food, sodas, ice cream, snacks, radios, MP3 players, clothing, shoes, and more. Recreation Services: Leisure activities at AUSP Thomson and the camp include organized and informal games, sports, physical fitness, table games, hobbycrafts, music programs, intramural activities, and social and cultural organizations. Wellness programs include screening, assessments, goal setting, classes, fitness/nutrition prescriptions, and counseling. An inmate photo program is also available. Recreation includes movies, physical fitness, and electric instruments.